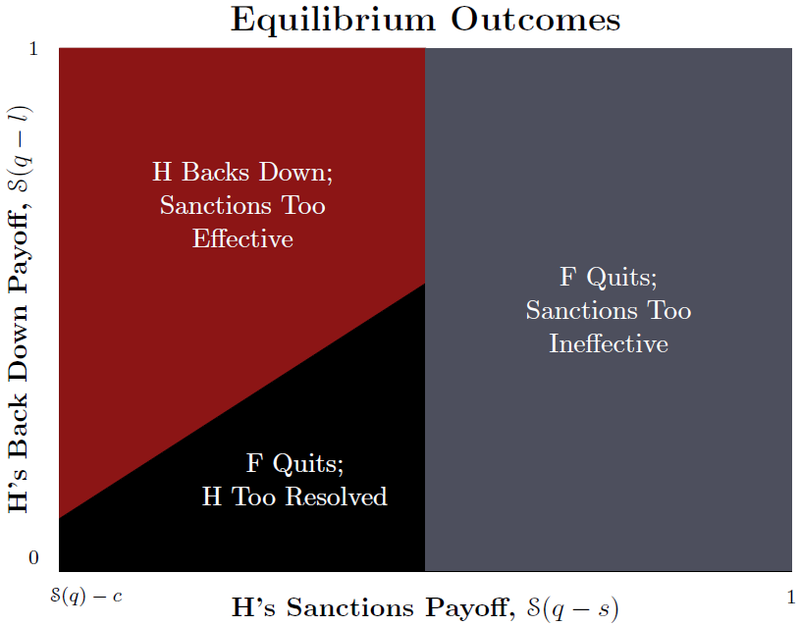 Abstract: What determines whether states impose sanctions on their rivals? We develop a formal model of domestic power consolidation, threats, escalation, and imposition of sanctions. With complete information, the target regime’s consolidation of power determines the result–leaders with stable control can weather sanctions and thus deter their imposition, while vulnerable leaders concede the issue. However, when an imposer is uncertain of a foreign leader’s consolidation, vulnerable types have incentive to bluff strength. Foreign powers sometimes respond by imposing sanctions, even though the parties would have resolved the crisis earlier with complete information. We then hypothesize that opponents of newer leaders are more likely to suffer from this information problem. Employing the Threat and Imposition of Sanctions (TIES) dataset and carefully addressing selection problems common to the sanctions literature, we show that sanctioners are indeed more likely to follow through on threats against such leaders. Published in International Studies Quarterly.